Our Man Mou Publishing is proud to announce a new ebook release – special collector’s edition of Chan Hon Chung’s Tiger and Crane Double Form Set Manual! Many masters consider Fu Hok Seung Ying to be a complete system on its own. As the famous saying goes: “Combination of Tiger and Crane has no enemy in the world!” (Fu Hok Hap Yat, Tin Ha Mou Dik). 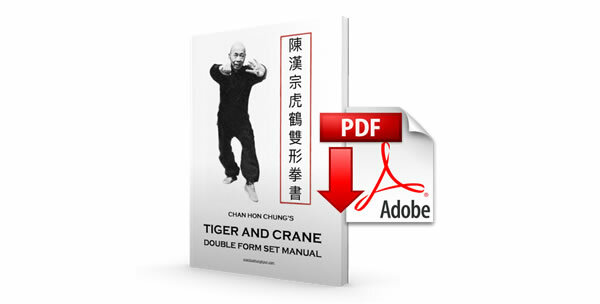 “Tiger and Crane Double Form Set” has been the subject of numerous books, the first being a classic “Lam Sai Wing’s” manual written by Jyu Yuk Jai, Grand Master Lam’s disciple. This entry was posted in Downloads, News! and tagged Chan Hon Chung, Fu Hok Seung Ying, Tiger and Crane Double Form Set, Tiger Crane on May 5, 2016 by Pavel Macek.